To assist you with date values, Transact-SQL provides the DATE data type. This data type counts dates starting from January 1st, 0001 up to December 31st, 9999. Therefore, to declare a variable that would hold a date value, use the DATE data type. In US English, this represents October 6th, 1036. To create a date-based column with SQL code, apply the DATE data type. Transact-SQL supports values of date types. 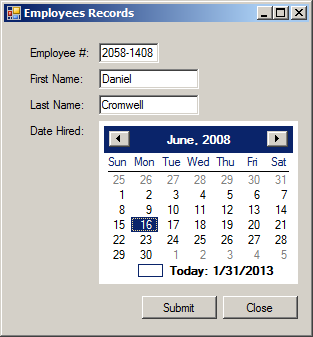 In a graphical application, the value can be provided by a text box, a masked text box, a calendar, or a date picker. Fortunately, the .NET Framework easily communicates a date value to Transact-SQL with no configuration or very little concern. The value should be passed as a string. As you may know already, the text box is the most fundamental control used to get values from a user. 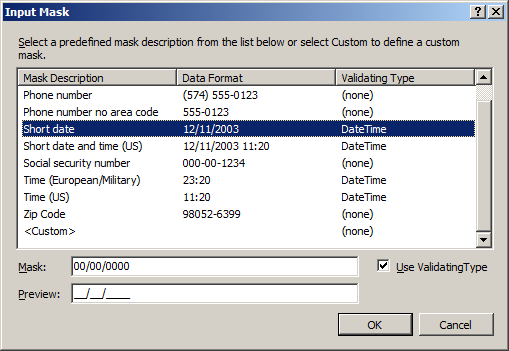 As such, you can request a date-based value from a user. A disadvantage of the text box is that it can receive any type of value. This means that there is no guaranty that the user would corectly enter a date value. This also means that you should make sure you validate the value the user would have entered. An alternative to the text box is the masked text box. It also you to restrict the characters and digits the user can enter into the control so you can make sure the user types a date value. The calendar control is the best control to make sure the user provides a valid date. The control is configured to make sure that the user can only select a date and cannot just type anything. When the user has typed a date, you can simply get the value from the calendar control and pass it to the appropriate column. Remember that you have many controls other than the calendar or the date picker that allow a user to provide a date value. If you use a control that does not impose date selection (like the calendar and the date picker do), you may have to validate the date or convert the value before passing it to the column of the table. Text-based controls are the easiest objects to present values to the user. Of course, the calendar must be able to recognize those values. This means that you either must have taken care of that when creating the table or you can take appropriate actions when retrieving the values of the column. Besides the month calendar control, the date picker is another good candidate to display date values. It primarily follows the same rules as the month calendar. When you sort records based on a column that uses the date data types, the SQL interpreter must be able to identify each date/time value. Fortunately, the database engine can validate each date value and reject those that are not valid. If you sort records from a column that uses a date-based data type, if the column has null sections, the records with null would show first. The values of a date field are sorted in chronological order. If the values use only date values, the records that occur first would come up first. If two records have the same value, the record that was created first would also come before the other. You can perform comparison for Not Greater Than operation, !>, on date values. This is the same as the Less Than Or Equal To operator "<="
Like a string, the value of a date is provided or initialized in single-quotes. Unlike a string, the value of a date must follow strict rules inside the single-quotes, otherwise the value would be invalid. When performing comparisons on date-based fields, you must keep those rules in mind. Unlike strings but like numbers, date values support all Boolean operators. As mentioned already, you have many options to use functions in your database. That is, Transact-SQL, the .NET Framework, and the Visual Basic library have many built-in functions you can use. You can also create your own functions in SQL or in a custom library (DLL). To convert a string to a date value in the .NET Framework, the DateTime structure is equipped with the Parse() method that is overloaded with various versions. This function takes two required arguments. The third is optional. If you are formatting a date, the first argument must have the original value. The second argument specifies how the formatting must be carried. A date value is made of one or many sections. If it contains many sections, they are separated by symbols, almost any, such as a period or a comma. In US English, the standard separators are / (forward slash) or - (dash). We will review the letters to use and their combinations. The first argument of this method is the same as the second argument of the Transact-SQL's FORMAT() function. The second argument is the same as the first argument of the FORMAT() function. Months are displayed using two categories: a number or a name. The months are numbered as follows: 1=January, 2=February, 3=March, 4=April, 5=May, 6=June, 7=July, 8=August, 9=September, 10=October, 11=November, and 12=December. To display only the number of the month, pass the format argument as MM (uppercase). In this case, the month is provided as an integer with 2 digits. If the number is between 1 and 9, it displays with a leading 0. You can display a month by its name using one of two formats: short (Jan, Feb, Mar, Apr, May, Jun, Jul, Aug, Sep, Oct, Nov, and Dec) or long name (January, February, March, April, May, June, July, August, September, October, November, or December). To display the short name of a month, pass the format as MMM (uppercase). If you want to display the year in two digits, pass yy (lowercases) as the format. When used by itself, yy produces the year of the date argument. The year is provided with 2 digits. In a combination with the day, the month, and the year, use yy to display the year with 2 digits. Examples are 06 or 14 or 68. Whether passed by itself or in an expression that contains the other parts, yyy (lowercase) or yyyy (lowercase) produces a year in 4 digits. If d (lowercase) is used in a combination with letters for the month and year, the day is provided as 1 (for days from 1 to 9) or 2 (for days from 1 to 12) digits. D (uppercase) should not be used in a combination with letters for the month, the day, and the year. ReturnedValue specifies the value to get from the date. The second argument is the date that holds the value from which the value will be produced. The date value must be a valid date. If the date value is not valid, the function would produce an error. For example, 20110229 would return an error since the month of February in 2011 did not have 29 days. The Value argument uses the same constants as for the DATENAME() function. The constants provided for ReturnedValue or Value are not case-sensitive. This means that year, YEAR, and Year would work the same. Transact-SQL provides additional functions to get the day, the month, and the year of a date.